← SPRINGTIME IN PARIS!!! OH, HOW WONDERFUL IT WOULD BE TO BE THERE!!! But in this same matter, touching Christian faith, there are other duties whose exact and religious observance, necessary at all times in the interests of eternal salvation, become more especially so in these our days. Amid such reckless and widespread folly of opinion, it is, as We have said, the office of the Church to undertake the defense of truth and uproot errors from the mind, and this charge has to be at all times sacredly observed by her, seeing that the honor of God and the salvation of men are confided to her keeping.But, when necessity compels, not those only who are invested with power of rule are bound to safeguard the integrity of faith, but, as St. Thomas maintains: “Each one is under obligation to show forth his faith, either to instruct and encourage others of the faithful, or to repel the attacks of unbelievers.”(12) To recoil before an enemy, or to keep silence when from all sides such clamors are raised against truth, is the part of a man either devoid of character or who entertains doubt as to the truth of what he professes to believe.In both cases such mode of behaving is base and is insulting to God, and both are incompatible with the salvation of mankind. This kind of conduct is profitable only to the enemies of the faith, for nothing emboldens the wicked so greatly as the lack of courage on the part of the good. Moreover, want of vigor on the part of Christians is so much the more blameworthy, as not seldom little would be needed on their part to bring to naught false charges and refute erroneous opinions, and by always exerting themselves more strenuously they might reckon upon being successful. After all, no one can be prevented from putting forth that strength of soul which is the characteristic of true Christians, and very frequently by such display of courage our enemies lose heart and their designs are thwarted. Christians are, moreover, born for combat, whereof the greater the vehemence, the more assured, God aiding, the triumph: “Have confidence; I have overcome the world.”(13) Nor is there any ground for alleging that Jesus Christ, the Guardian and Champion of the Church, needs not in any manner the help of men. Power certainly is not wanting to Him, but in His loving kindness He would assign to us a share in obtaining and applying the fruits of salvation procured through His grace. The chief elements of this duty consist in professing openly and unflinchingly the Catholic doctrine, and in propagating it to the utmost of our power.For, as is often said, with the greatest truth, there is nothing so hurtful to Christian wisdom as that it should not be known, since it possesses, when loyally received, inherent power to drive away error. So soon as Catholic truth is apprehended by a simple and unprejudiced soul, reason yields assent. Now, faith, as a virtue, is a great boon of divine grace and goodness; nevertheless, the objects themselves to which faith is to be applied are scarcely known in any other way than through the hearing. “How shall they believe Him of whom they have not heard? and how shall they hear without a preacher? Faith then cometh by hearing, and hearing by the word of Christ.”(14) Since, then, faith is necessary for salvation, it follows that the word of Christ must tie preached. The office, indeed, of preaching, that is, of teaching, lies by divine right in the province of the pastors, namely, of the bishops whom “the Holy Spirit has placed to rule the Church of God.”(15) It belongs, above all, to the Roman Pontiff, vicar of Jesus Christ, established as head of the universal Church, teacher of all :hat pertains to morals and faith. No one, however, must entertain the notion that private individuals are prevented from taking some active part in this duty of teaching, especially those on whom God has bestowed gifts of mind with the strong wish of rendering themselves useful.These, so often as circumstances demand, may take upon themselves, not, indeed, the office of the pastor, but the task of communicating to others what they have themselves received, becoming, as it were, living echoes of their masters in the faith. Such co-operation on the part of the laity has seemed to the Fathers of the Vatican Council so opportune and fruitful of good that they thought well to invite it. “All faithful Christians, but those chiefly who are in a prominent position, or engaged in teaching, we entreat, by the compassion of Jesus Christ, and enjoin by the authority of the same God and Saviour, that they bring aidto ward off and eliminate these errors from holy Church, and contribute their zealous help in spreading abroad the light of undefiled faith.”(16) Let each one, therefore, bear in mind that he both can and should, so far as may be, preach the Catholic faith by the authority of his example, and by open and constant profession of the obligations it imposes. In respect, consequently, to the duties that bind us to God and the Church, it should be borne earnestly in mind that in propagating Christian truth and warding off errors the zeal of the laity should, as far as possible, be brought actively into play. Summa theologiae, IIa-IIae, qu. iii, art. 2, ad 2m. Constitution Dei Filius, at end. This entry was posted in Uncategorized and tagged Christian faith, Jesus Christ. Bookmark the permalink. 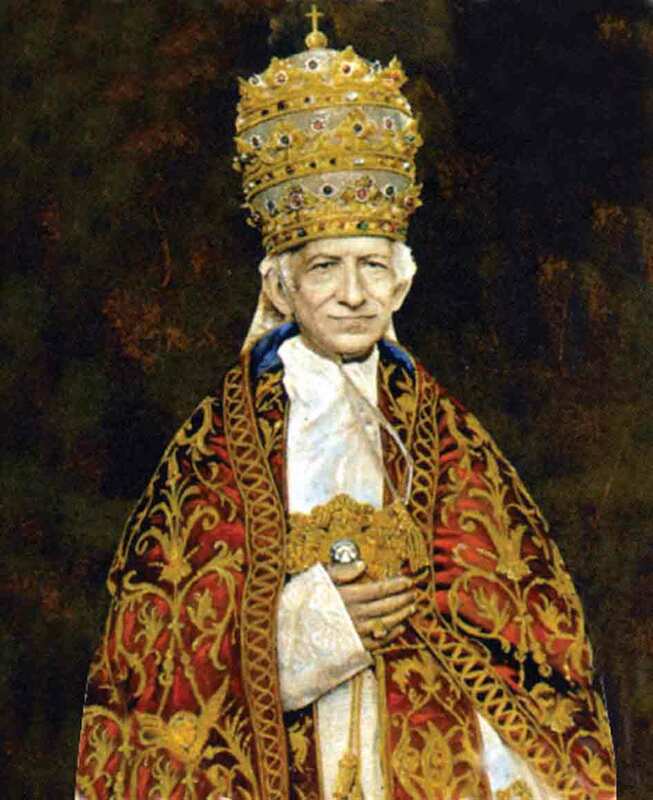 One of my favorite Popes who is often forgotten. I was delighted one labor day weekend when a priest in a neighboring parish quoted his encyclical on work.